Aubree’s Pizzeria and Grill has been serving up great pizzas from their historic Depot Town spot since 1972. This classic eatery, which fuses 19th-century restaurant atmosphere, with 21st-century service and convenience is certainly a great place to hang out at while in Ypsi! Aubree’s Pizzeria’s main dish is, of course, pizza. They offer many great flavors and styles. Their Signature pizzas include the Tuscan Sun, which has spinach, feta cheese, and sun-dried tomatoes with their signature five-cheese blend; the Sicilian, which has olive oil, salami, Kalamata olives, tomatoes and their five-cheese blend all on their house-made dough; and my personal favorite, the Louisiana Cajun, which has Cajun sausage, roasted red peppers, sautéed onions and their five-cheese blend mixed in with chili sauce and green peppers on Cajun flavored crust. Their Legendary Classic pizzas include their signature Big Kahuna pizza, which has chicken, ham, pineapple, bacon, and red onions with their in-house Frog Island BBQ sauce; the Supreme, which is topped with pepperoni, Spanish onions, green peppers, mushrooms, and Italian sausage with pizza sauce and their five-cheese blend; and their BBQ Chicken, which has their popular Frog Island BBQ sauce topped with chicken, bacon, red onion, and four-cheese blend. Pizzas aren’t the only things on their menu. Their hand-crafted sandwiches include the Bourbon BBQ Chicken Sandwich, which has grilled chicken breast covered with their BBQ sauce and topped with bacon, cheddar cheese, and coleslaw. Their Firehouse Burger has spicy capicola, jalapenos, mild pepper rings, provolone cheese, mayo, and sriracha chili sauce on a pretzel bun. Aubree’s is located at 39 E. Cross Street, in the heart of historic Depot Town, an up-and-coming entertainment district located only a 10-minute walk from EMU’s main campus. If you don’t have the time to visit their charming Victorian-era spot, then you can call and have your food delivered to your dorm or apartment. 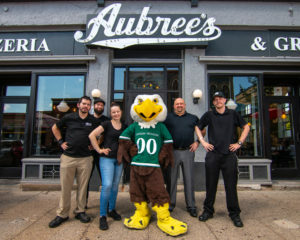 Aubree’s Pizzeria and Grill is a member of the Eagle Discount Program, providing a 20% discount to all students, staff, faculty, and alumni who show their Eastern ID. With great food, historic charm, and a stellar location, we are proud to promote Aubree’s Pizzeria and Grill as August’s Eagle Discount Program Business of the Month! Gary Simmons is a senior from Muskegon, Michigan who is majoring in both Journalism/Media Studies and Urban Planning. When he isn’t out promoting EMU/Ypsilanti with the Go Social! Team, he is either writing articles for the Eastern Echo, working on TV programs with EMU’s student-ran ETV station, or is making people laugh with Laugh-a-Minute Enterprises. He is also a member of the Filipino-American student org Kapamilya Club.